Oh what a lovely tribute to dear old Henry and a wonderful picture. It made the tears come all over again – happy/sad tears. It was so strange to get up this morning and realize that I didn’t need to go first to the garden to unleash him from his nighttime duties. I trust he is chasing heavenly rabbits – or apples – his new doggie paradise. …oh my – another doggy friend gone – he was a good “guy”, we loved to have him around. Henry was such a wonderful part of a visit to your forest home. He was so sweet and calm, I will have an apple for him today. As usual, your thoughts are said with such grace, Katherine. Henry must have adored you as well as your wonderful mother. As usual, your thoughts are said with such grace, Katherine. Henry must have adored you. I send my consoling thoughts to your wonderful mother. 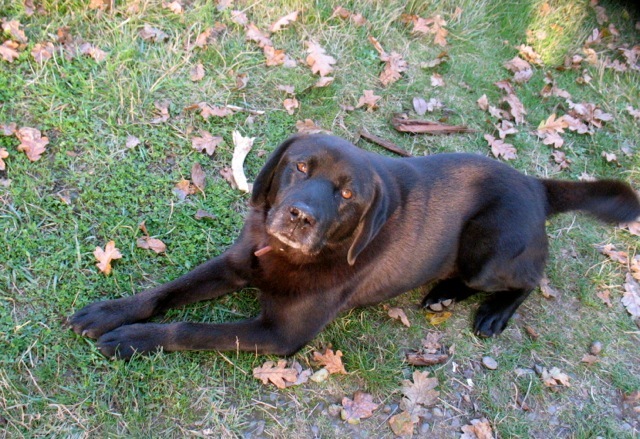 Love labs, I imagine he had a wonderful life and lots of good eats over the years. So sorry for the loss of your mother’s pal. Has been a sad weekend, indeed, in the neighborhood! What a beautiful tribute to Henry! I just recently shared with your Mother, that for all of these years, I have spent my summer evenings in my garden, to hear at sunset, the arf, arf, arf, of Henry, being delegated to the garden, for his night time guarding job….I would always smile, and sometime shed a tear, knowing it meant my dear friend, Sarah, was in her garden also! My labs, and I, will miss our special friend over the ridge! Aw, Henry! Rest in peace, puppy. The first day I met Henry, Sarah and were talking, but Henry was barking every few seconds, loudly. An interrupting dog. A few weeks ago he walked in the woods with me. When a coyote crossed the road, he saw it before I did and threw his all into the chase. I salute him for his faithful years with Sarah.